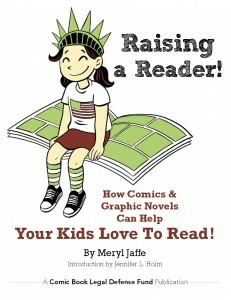 The Comic Book Legal Defense Fund is proud to release “Raising a Reader! 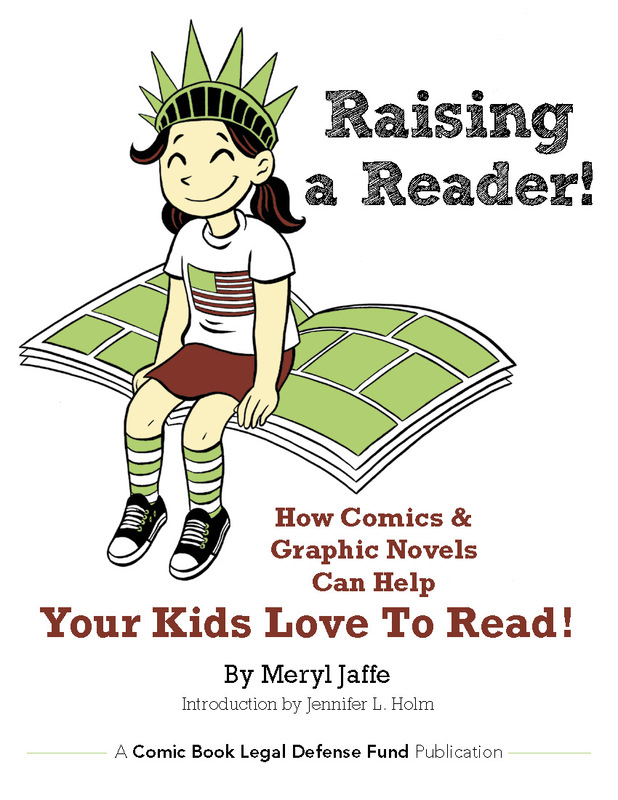 How Comics & Graphic Novels Can Help Your Kids Love To Read!,” a new resource for parents and educators about the learning benefits of comics! This new resource is written by Dr. Meryl Jaffe, with an introduction by three-time Newbery Award honoree Jennifer L. Holm (Babymouse, Squish) and art by Eisner Award winner Raina Telgemeier (Smile, Drama) and Eisner Award nominee Matthew Holm (Babymouse, Squish). Graphic design was handled by Brooklyn-based designer David Herman. Raising A Reader! was made possible by a grant from the Gaiman Foundation. A digital edition premieres this week on comiXology, with a print version premiering at CBLDF booth #1920 at Comic-Con International: San Diego. Raising A Reader! answers the questions parents and educators bring to using comics: What skills do graphic novels offer kids? What resources are available for using graphic novels in education? How do you teach reading with a comics page? How can graphic novels create reading dialogues? And much more! Please visit www.cbldf.org to download a copy of Raising A Reader, and be sure to stop by CBLDF booth #1920 at Comic-Con International to get your copy! Meryl Jaffe, PhD, teaches visual literacy and critical reading at Johns Hopkins University Center for Talented Youth OnLine Division and is co-author of Using Content-Area Graphic Texts for Learning. She used to encourage the “classics” to the exclusion of comics, but with her kids’ intervention, Meryl has become an avid graphic novel fan. She now incorporates them in her work, believing that the educational process must reflect the imagination and intellectual flexibility it hopes to nurture. Meryl hopes to empower educators and encourage an ongoing dialogue promoting kids’ right to read while utilizing the rich educational opportunities graphic novels have to offer. More information can be found atwww.departingthetext.blogspot.com. Jennifer L. Holm is a New York Times bestselling children’s author and the recipient of three Newbery Honors for her novels Our Only May Amelia, Penny from Heaven, and Turtle in Paradise. Jennifer collaborates with her brother, Matthew Holm, on two graphic novel series — the popular Babymouse series and the bestselling Squish series. She is also the author of several other highly praised books, including the Boston Jane trilogy and Middle School Is Worse Than Meatloaf.